I'm not a fan of Ed's "one nation" new new labour. But the Daily Mail is a scummy paper no-one with a brain cell should buy. The disgusting story - story being the operative word - they sold as reportage about Miliband's father, Ralph, was abhorrent. Basically, what this paper was saying was that if you disagree with the system and hierarchy of the semi-feudal, undemocratic Etonian billionaire run present UK, you don't belong here. The piece also had overtones of anti-semitism and anti-immigration that peppers this nasty rag daily. The lies and deceit this paper sells as "self evident truth" are disgusting. It is an extreme right propaganda rag that attacks anyone with a modicom of decency and publishes lurid stories and commentary about teenaged girls. It is just a more sophisticated, and therefore more dangerous, nazi loving version of "The Daily Sport." The strange thing is that so many people buy and read it for information on politics and society. This paper has raged a war on the working class and those who try to represent us, for years. I hope Ed and those biting back at this billionaire propaganda sheet take it down. These multi-millionaire controlled media outlets confuse and lie. For truth, read books instead. Or at the very least think hard about who really represents a fair future for everyone's children. 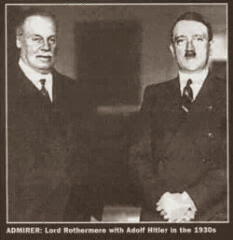 The photo shows a man who hated Britain- Hitler, Oswald Mosely, the fascists friend- the proprieter of the Daily Mail, Lord Rothermere.